Weight loss pills: hazardous or healthy? Weight loss pills are widely available and doctors will actually give out prescriptions for them if they feel your weight is a major health concern. They are mostly recommended for severely overweight and obese people with 30% body fat or more, and can help these individuals significantly reduce their fat percentage in less time. With some obese individuals it is important to cut a lot of weight because of health concerns such as high blood pressure, cardiovascular problems, diabetes, bad knees, etc. However, these weight loss pills work in conjunction with caloric restrictions and increased physical activity to produce good results, and people tend to assume that a pill will magically burn away hundreds of pounds while they lie in bed and watch TV. Since a large percentage of the population is overweight or obese, and a lot of these overweight individuals also have other medical complications, the question is raised about the side effects and potential health risks of using weight loss pills. We need to learn a little bit about the different types of weight loss drugs and how they work before we can understand their potential benefits and dangers.
? Appetite suppressants - this type of pill blocks serotonin and norepinephrine absorption in the hypothalamus, thus tricking the brain into thinking that you are full and making you feel satiated. This can successfully regulate gluttonous appetites that can prevent people from sticking to low calorie diets in the long term.
? Fat blockers - this type of pill prevents the breakdown of fat by the enzyme lipase, which allows a good part of the fat we eat to remain unprocessed and go through the body without being absorbed. The extra fat is expelled through bowel movements.
? Fat burners - this type of pill helps break down stored fat so that it can be used as energy. It often serves the dual function of burning fat and increasing energy. They contain caffeine and ephedrine, usually combined with aspirin and sometimes willow bark. Each type of weight loss pill uses a fundamentally different tactic to help you lose weight - either fooling your brain into not feeling hunger, or preventing the absorption of fat, or helping to burn off fat more efficiently. It is up to the person to choose the option that is most convenient to them, as each of these will have unique side-effects.
? Appetite suppressants - the effects of these drugs don't last very long and some of the side-effects include: dry mouth, anxiety, increased heart rate and blood pressure, excessive sweating, headaches, tremor, constipation, insomnia and feeling dizzy or lightheaded.
? Fat blockers - a commonly sold, over the counter fat blocker is Xenical is considered by many standard to be fairly safe, but has a few side-effects that include: loose and oily stools, flatulence, more frequent bowel movements. The drug works by preventing a part of the fat to be absorbed, so frequent and oily bowel movements are really a necessary part of the process, rather than negative side-effects.
? Fat burners - this type of weight loss pill carries the greatest risk as they contain substances that affect heart rate (coffee and ephedrine). They can cause increased or irregular heart rate, anxiety, mood swings, and in extreme cases heart attack and stroke. The greatest health risk comes from cheap pills found online, that promise fat burning effects but are actually made in less than adequate conditions, with no quality control to speak of. Most over the counter drugs are fairly safe and can have some minor side effects like anxiety, headaches or insomnia. 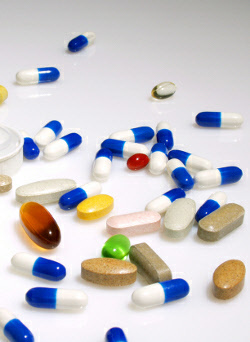 As with any drug, taking weight loss pills in high quantities will increase the risk of more serious problems. Older fat burners contained ephedra combined with caffeine, but ephedra proved to cause great problems with heart rate for some people and products containing it were eventually pulled off the market due to over 100 deaths being caused by the use of these products. Another concern is that people with weight problems often develop body dysmorphic disorder - a disorder where people have an unrealistically negative body image, e.g. thinking that they are still too fat even though they have lost a lot of weight already and are reasonably fit - and are prone to developing a dependency to the weight loss drugs, and often take very high dosages. Although the benefits of most FDA approved prescription weight loss pills far outweigh the negative side-effects, those that only struggle with a little extra weight, some 10-30 pounds, should look into some alternatives. Caffeine based supplements are good at promoting weight loss and giving you extra energy, while meal replacement is a good way to avoid overeating and keep you on track. However, some pre-workout supplements may cause adrenal fatigue and increased blood pressure. The simplest way of getting caffeine in your system is to simply drink some coffee, or, even better, a few cups of green tea a day, as it has been shown to have some fat burning properties. Red hot chili peppers (no, not the band, the edible plant) have also been shown to give good results. Having a well-regulated low calorie diet, drinking meal replacement shakes a couple of times a day in addition to exercising regularly - full-body weight training three times a week and cardio for 15-20 minute every day - will have great impact on your weight loss and should be the core of your weight loss strategy. In order to lose weight effectively you will need to have a balanced, healthy diet that keeps you in a caloric deficit; exercise on a regular basis; and the pills should only be used to give you an added bonus on top of your other efforts. The pills have their share of side-effect, but they are, with the exception of those pulled from the market and cheap knock offs bought from strangers on eBay, pretty safe when used under medical supervision. They should be a last resort, used by those who are obese and are already dieting and exercising, but need to speed up their weight loss.